I don't mind growing old, generally I like to model myself on a combination of Dame Edna Everage and Tina Turner but its my birthday today and I am really feeling those 62 years. Actually I've probably been out and about too much, since Wednesday I've been to Edinburgh, to visit my family in Yorkshire, to York, to Glasgow for a dinner dance and had a tour round Loch Lomond. I've spent an awful lot of time travelling and not enough time with the people I care about. I did catch up with my great niece Amelia for a few hours. 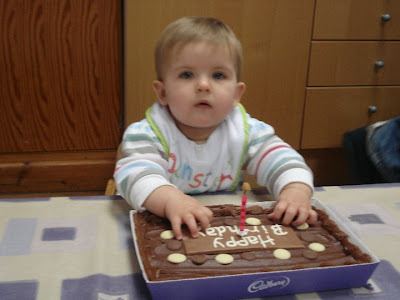 It was her first birthday recently and wisely she celebrated with two cakes, one made by her Mum and this one from her nursery. Amelia is absolutely adorable, I wish I could have stayed with her longer. Today I'm taking it easy at home, the stove if lit and knitting is calling, I have nothing planned this week until a girlie lunch on Thursday, hopefully I shall be feeling a bit younger by then. So which parts of them are you going to keep? Tina has fab legs. Happy Birthday Jenny! Hope you have had a lovely day indulging yourself with all things yarny. My 62nd last week so I know how you feel! Still young inside! Best wishes for a lovely day......the trick to not feeling your age is to throw in a couple of power naps, works a treat for me! Happy Birthday...take a seat and rest your feet and have a cup of tea. You'll feel 59 1/2 before you know it!! Belated birthday greetings. Sounds like a good idea to take a breather after all of that dashing about. Happy Birthday to you!! I am the same age and I do know how you feel!! Emily is a little beauty! Happy Birthday! Enjoy putting your feet up - was there any chocolate cake left for you?! Happy (belated) birthday! I think the best truffles I ever had were from a little store in York. I still dream about them. sending you lots of Love and Hugs..